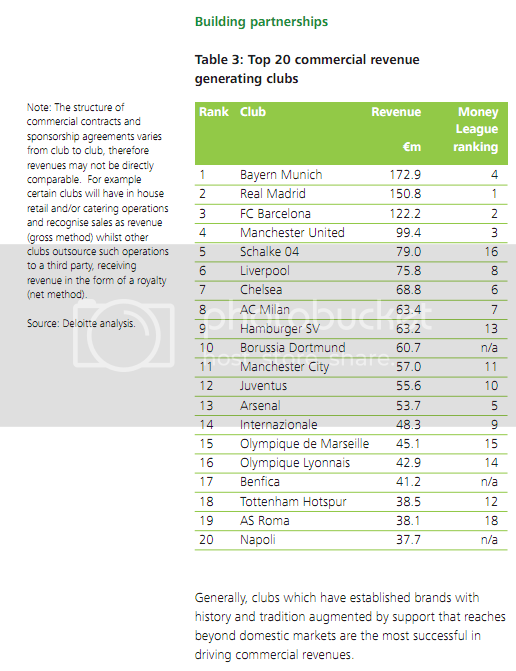 According to Deloitte's annual Football Money League report, Bayern Munich is the football team that generates the most revenue from business partnerships. The team jumped from #4 to the top spot this year, as Deloitte says that the €172.9m the club earned from commercial activities now represents over half of the team's total revenue. Bayern still ranks fourth in total revenue with €274.1m; coming behind Real Madrid (€438.6m), FC Barcelona (€398.1m) and Manchester United (€349.8m). The team's recent winning ways have played a direct role in help squeeze more revenue from existing partnerships. "The club’s on-pitch success during 2009/10 is likely to have contributed to this growth by triggering performance bonuses attached to their sponsorship deals" the report says. Also of interest was how team revenue streams seem to proportionally contribute to overall revenue, depending on where the club is located. 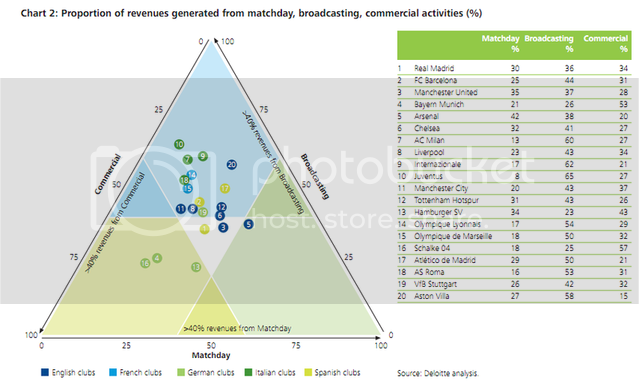 The study indicates that German clubs seem to get the greatest percentage of their overall revenue from commercial partnerships, while Italian clubs get the majority of their revenue from broadcasting and English are more diversified in their broadcasting, commercial and matchday revenue streams. You can read Deloitte's full report for yourself here.